Confucian thought is alive and well in today’s modern China. Confucianism continues to impact 21st century Chinese civilization; in ancient times, it was the "state religion" of imperial China. This philosophy also has had great impact on the Chinese education system for centuries. Even today, with China evolving and having become a global superpower, the ancient concepts developed by Confucius live on among the Chinese people, and they are incorporated into the modern educational system. 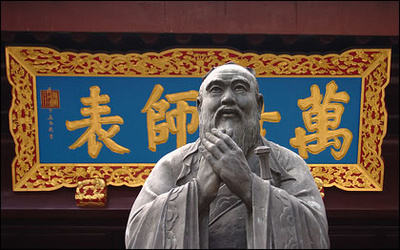 Confucianism derives from the teachings of the Chinese sage Confucius. His ideas encompass a complex system of moral, social, political, and religious thought. Confucianism (儒学; rúxué) is considered an ethical and philosophical system, which rose as the main state ideology during the time of Emperor Wudi in the Western Han Dynasty (206BC- 8AD). Orthodox Confucianism was significant in establishing the ideological foundation in the feudal society of ancient China. It remains a base of the Chinese communist ideology today. I now briefly introduce Confucian thought, by discussing its relationship to the following concepts: rites, relationships, filial piety, loyalty, humanness, the perfect gentleman, and meritocracy. Next, I briefly discuss Confucian ideology in elation to the Chinese State and to the Chinese educational system. Chinese society is known for its concern about face, which can mean that people must behave properly, show respect to others, and also receive be respect. The above passage highlights not only how the law and ritual differ, but also illustrates a key difference between Western and Eastern societies. Laws keep citizens under mindless control, whereas rituals instill strong behavioral norms that cause people to behave properly in order to avoid losing face. Thus, by knowing how to behave, by following the rites and norms of society, becomes more powerful than any kind of administrative penalties. Chinese children are socialized at home and at school to conform to Confucian norms. In Confucian thought, the Chinese character "rite" (禮; lǐ) is complex, with the meaning ranging from politeness/propriety to accepting/understanding one’s correct place in society. This hierarchy distinguishes people by age, gender, and position in home and work, outlining a person’s duty toward others and vice versa. Ritual socializes and internalizes correct behavior, which becomes formalized; sincerely following ritual helps people to cultivate themselves and fit smoothly into society. Everyone has a proper place in society which is identified and strengthened via protocols and ceremonies. Likewise, Confucianism hierarchies address relationships between people, who have differing duties arising from their status in relation to others. A person may have different duties with different people; as a son in relation to parents and elders, and as a father in relation to children, as a senior in relation to younger siblings, students, and coworkers. The young must revere and serve their seniors, but elders should also be benevolent toward juniors. This theme is highlighted by filial duties on the part of children toward parents and elders, and by the great concern of parents toward their children. Children who go to school are often trying to excel because it will bring honor to their parents; likewise, parents will sacrifice financially to help their child get the best possible education. After the child graduates and enters the workforce, it is still expected that this child will give back to his or her parents, by supporting them in their old age. Children also feel great respect and affection to their teachers, especially those who have helped them to succeed academically, and as adults they may revisit their schools and bring their teachers small gifts. In Confucian thought, filial piety (孝 xiào ) is one of the greatest of virtues; it transcends death (hence, ancestor worship). and must be shown towards both the living and the dead. Children show respect and obedience to their parents, especially to their fathers. In addition, piety also encompasses five cardinal relationships (五伦; wǔlún): 1) ruler and subject (君臣 junchen); 2) father and son (父子 fuzi); 3) husband and wife (夫婦 fufu ); 4) elder and younger brother (兄弟 xiongdi); 5)between friends (朋友 pengyou). Over the centuries, the importance of filial piety has been incorporated into Chinese law. A criminal, for example, is still reviled and punished more harshly if a culprit has committed the crime against a parent. Likewise, in schools, from kindergarden onwards, pupils learn to respect their elders, to obey them unreservedly, and to look to the past for wisdom. Loyalty is another type of filial piety, addressed toward one’e leaders. In ancient times, ambitious young Confucian scholars loyally served their rulers. But because China had historical periods of autocratic regimes, Confucius also advocated obeying leaders who demonstrated great moral rectitude. Rulers also had responsibilities toward those they governed. Likewise, students in China are very loyal to their schools, their teachers, and to their friends. Confucius felt that people matured within the context of human relationships. In addition to ritual and filial piety, the Confucian concept of humaneness (仁; rén) expresses the way mature people should behavior toward each other; this is expressed in the Confucian version of the Golden Rule: "Do not do to others what you would not like them to do to you". Rén is also a political concept. If the ruler lacks rén, his subjects may also lack it. Rén is espoused to keep despots from behaving cruelly toward their subjects. If a ruler behaves inhumanely, he may lose the "Mandate of Heaven;” the right to rule. Benevolent rulers, however, should be obeyed strictly. Students learn about rén from primary school onwards, and teachers offer prizes for both academics and to those displaying ren. This concept is part of a child’s moral education. Classic Confucian thought has the term "jūnzǐ" (君子) or "perfect man," an ideal to which everyone should strive. Such a person should be a saint, scholar, and gentleman. Clearly, there is a masculine bias in Confucianism, which has weakened somewhat over the centuries. In the past, the Chinese hereditary elites were expected to act as moral guides for the rest of society; today the Communist Party members are expected to take this role. Such leaders must: live a moral life; participate and perform rituals correctly; display filial piety and loyalty; be humane. The opposite of the gentleman was the small person, xiǎorén (小人), In this context small indicates a petty mind and heart, selfish, greedy, superficial, and materialistic man. Teachers speak about this concept to students in their ethics classes; students are praised when they display the qualities of being a “perfect man” (or woman). "In teaching, there should be no distinction of classes." By replacing the nobility of blood with that of virtue, Confucius broke the barriers of class, making him admired by western philosophers, such as Voltaire. This, a Confucian "gentleman" could derive from a common man who had cultivated himself, while a corrupt king’s son could be a "small man". Originally, Confucius struggled against ancient Chinese feudal structures; today his ideas are incorporated into Chinese communist thinking, which philosophically also advocates meritocracy. This Confucian idea of meritocracy was introduced by the Imperial examination system in ancient China. Anyone who passed this examination could be a government officer, a position of prestige and honor to his family. Unfortunately, this idea of a state exam has passed on into education, with students from all over China taking the same sets of standardized tests to compete for prestigious places, and ultimately, jobs. In sum, as a political philosophy, Confucianism considers relationships more important than the laws. This paradigm may lead government officers and others with power, such as teachers, to take their own self interests, rather than the common interest, into consideration, resulting in corruption and nepotism. In China, in the past and in the present, government salaries have been low, so workers seek ways to add to their incomes. Thus, Confucian precepts have been accused of creating a system that encourages bribes. In education, Confucian thought has extolled the role of the scholar, but Chinese society does not offer educators and professors high wages. In China, teachers at all levels are highly respected for their work, and, in accord with Confucian thought, they expect complete obedience from their students. Thus, the Chinese educational system differs from western and modern Russian educational models, as teachers have complete authority, moral and rational, in their classrooms. Despite sharing ideas about meritocracy, initially, the Communist Party did not embrace Confucian thought. In fact, during the Cultural Revolution, Chairman Mao ridiculed Confucius. But in recent decades, Confucian ideas have regained popularity among the government authorities. In China, Confucian study programs exist within the Chinese education system, ranging from specialized kindergarten classes to university philosophy departments. There are also Confucian-themed CEO education programs for businessmen. Confucianism is quintessentially Chinese, unlike communism, which was imported from abroad. The official Chinese governmental overseas cultural and linguistic study centers are even called “Confucius Institutes.” They offer Chinese culture and classes (and scholarships to foreign students), and serve to convey positive soft propaganda to the world at large. Currently, the Communist Party has promoted official slogans indicating Confucian undertones. Clearly, Confucian ideas, with their emphasis on unquestioned obedience to authority, are useful to China’s rulers. In recent decades, with rising economic and regional disparities, corruption, and social tension, ordinary Chinese people are finding solace in Confucian values (just as some Americans are adhering to Christianity). Moreover, Chinese leaders, who are struggling to maintain their legitimacy and authority in a time when the ideological underpinnings of communism have given way to a more capitalistic open market system perceive Confucianism as a kind of pre-established pure Chinese ideology which teaches people to accept their place. More importantly, it also advocates Chinese not to challenge the ruling party elites. Yet there are drawbacks in the way Confucian thought has become the bedfellow with the ruling Han ideology. According to Confucius, those at the top must prove their worthiness to rule. Some Chinese leaders have been caught in corruption scandals, shaming the party as well as the individual. Confucianism does not really address a government authorities main worries: remaining legitimate while also getting rich. As long as the bulk of the Chinese people continue to improve their standard of living, as long as the economy grows and people prosper, the communists retain their authority to rule. But it is not known whether Confucian or communist ideologies will serve to support the current ruling elite if and when economic growth falters. Confucian thought impacts students both at home and in the classrooms. For example, here follows an excerpt of an interview with a Russian mother who has a Han Chinese husband. Their ten year old daughter attends the university sponsored (government) primary school where both the parents work; they also live on the campus in government housing. This is what she said when I asked her about differences between Chinese and Russian parenting and educational systems. Nina: ...the Chinese way of parenting children is more traditional. It is more traditional and it preserves Chinese traditional beliefs, I mean that Chinese culture, Confucian concepts, demands veneration of ancestors and parents, and, so, on this basis there's the attitude: parents want their child to be educated, parents want their child to follow their advice, so, that means the child must obey. In this way it is traditional, (it is Confucian); it is, so called, Confucian parenting, yes, this system requires obedience to parents, adults, and respect for all elders. The Russian way of parenting has been already affected by the civilized (western) countries. But the traditional Russian parenting, which had existed before the revolution, I think, has been destroyed; children totally obeyed parents (at that time). …что китайское воспитание, оно более традиционное. Оно более традиционное и сохраняет традиционные, значит Конфуэс устои, то есть, ну вот это китайское почитание родителей, послушание родителей и, соответственно, исходя из этого всё и отношение: если надо учиться, если надо слушаться, то ребенок должен слушаться полностью. Вот в этом смысле это традиционное, (следует Конфуэс) такое воспитание, да, послушание родителей, взрослых, уважение к старшим. Русское воспитание, оно, конечно, испытало на себе зна… очень сильное влияние уже цивилизации. И патри… вот это традиционное воспитание, то, что у на… то, что было в России, конечно, ну это до революции было… тоже такое же, такие же традиции были: полное послушание, подчинение взрослым - это, конечно, разрушено полностью, я считаю. Nina: Respect for the child's individual should be a two-way: the rights of parents shouldn't suffer. Yes. I think a lot about that now, because we've got such kind of a problem when I try to raise my child in a [modern] Russian way. I pay attention to the fact that a child should feel herself free to help to disclose her individuality. But her father sometimes let me know, that it is not the way children are parented here, in China. And, maybe, I was trying to preserve my Russian way of parenting, so, now, I reap the fruits of this... (laughing)... this is really not so good for my child, because now I understand, I was not right bringing this model to our family. Because in this model, the Russian, the western model, children are left to create themselves... and a child becomes a dictator in a family. VS: Like in America? - Как американки? Nina: ...I decided, that my child should study at the embassy school for ex-patriot children in Beijing. ... So, we enrolled her in the school. ... she, for first time in her life, experienced a Russian school. She saw there were not sixty pupils in a class, she saw the teacher was actually kind... That really inspired her. ... я решила записать её в посольскую школу на экстернат, в посольской школе есть экстернат... Мы поступили... Она увидела обстановку русской школы, что там не шестьдесят человек, учительница была очень доброжелательна, познакомила её с классом очным, она посидела один урок... Вот это вот, конечно, её очень вдохновило. In sum, Confucian concepts are respected and honored in modern China, by Chinese and foreigners alike. Clearly, Confucian moral values also live on in Chinese schools. Students learn how to have successful relationships with people of different ages, how to behave according to the the concepts of ren. In school, students learn to share and be kind; they also treat each other equally. Clearly, Chinese schools offer academic as well as moral training, per Confucian philosophy. What I find intriguing about the original clash between Confucianism and Communist ideology is that while Confucianism was a native philosophy of life, Communist Marxian philosophy is a Western importation but was nevertheless privileged vis a vis Confucianism. That is a paradox worth pondering still today because it reveals much about a government tied to an ideology which conceives this short earthly life all there is for man and rejects transcendence, which is another way of saying that it rejects the ultimate goals of human existence and settles for its penultimate economic goals. That goes a long way in explaining the rejection of religion (dubbed "poison" by Mao)and its transcendent values in favor of a pragmatic utilitarian economic theory mired in materialism. This seems to me a poor bargain indeed!